When you integrate a Dialogflow bot in Kommunicate Dashboard, it asks you which API version you are going to use. 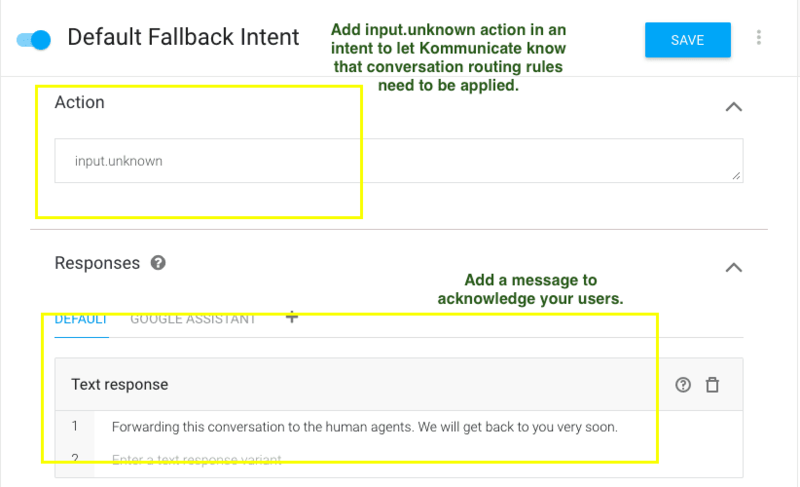 In case you have upgraded the bot in dialogflow from V1 to V2, don’t forget to update it in Kommunicate Dashboard. We recommend you to upgrade all your bots to V2 API as there are certain features which only work with Dialogflow V2. Hence, we highly recommend shifting to Dialogflow V2 API. Once configured, you should check your bot in Dialogflow’s “Try it out” section. If your bot is not working as expected, you need to check the configured intents and entities. 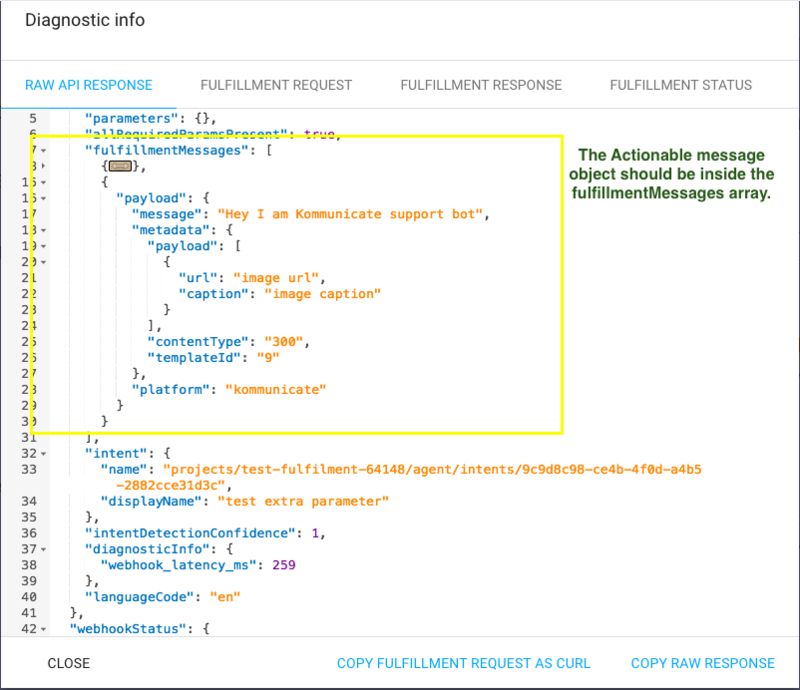 You can inspect the fulfillment request and response by clicking on the “Diagnostic info” button on your Dialogflow console. The response you want to send to the user should be inside the fullfillmentMessages Array. You can use actionable rich messages as well as text response. Here is the sample image from Dialogflow console. When a new conversation is created, Kommunicate triggers a WELCOME event. You can write the Welcome Message or configure an actionable message as the response of this event. 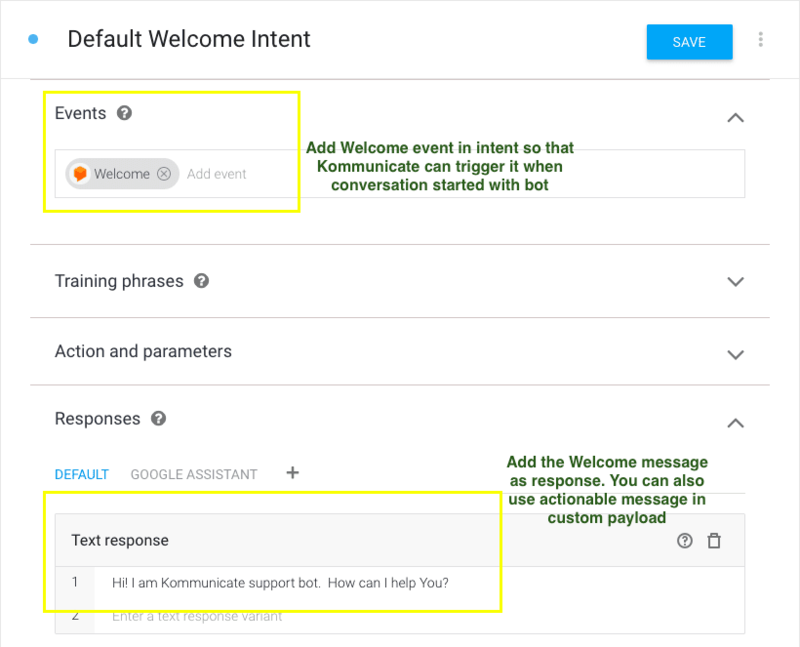 You can enable the default welcome intent of Dialogflow or create a new event and add the WELCOME event in it. You can give agent handoff capability to your bot easily. The action input.unknown helps you to achieve this. Kommunicate server treats this action as a sign of agent’s handoff and applies the existing Conversation Routing rule on the conversation as soon as input.unknown action is detected. input.unknown action is associated with Default fallback intent by default. But you can add this action in a new intent to enforce the routing rule on the conversation. If you want to bot keep replying and don’t wish to add any agent in conversation you can remove the input.unknown action from intent. Alternatively, you can assign the conversation to a specific agent by passing agent id in the custom payload as described here.